Fri, Aug 10, 2018, 12:45 pm SL Time, ColomboPage News Desk, Sri Lanka. Aug 10, Colombo: The independent Audit Services Commission will commence its proceedings from today, the Chairman of the commission, Auditor General Gamini Wijesinghe said. 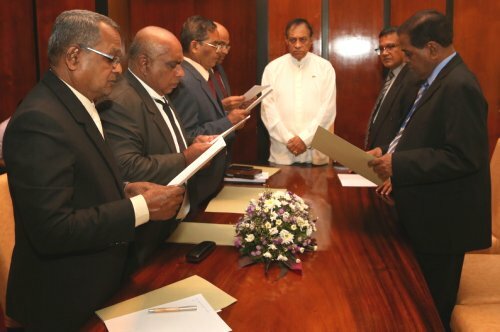 The Chairman and other members of the independent Audit Services Commission took oaths before Speaker Karu Jayasuriya on Thursday (09). Acting Secretary General of parliament Mr. Neil Iddawela was also present at the occasion. Addressing the gathering, Speaker Karu Jayasuriya said, the passing of the Audit Act, which was an utmost necessity for the country, is truly a victory for the people. He said that the Right to Information Act has won global praise and in the same way, the Audit Act will earn a good reputation for the country, as it is a strong piece of legislation.